Magnificent creatures. I understand they can be dangerous, at least in close quarters. Good for you! I have heard that moose are called Forest Ghosts because they can hide their huge frames so wonderfully. 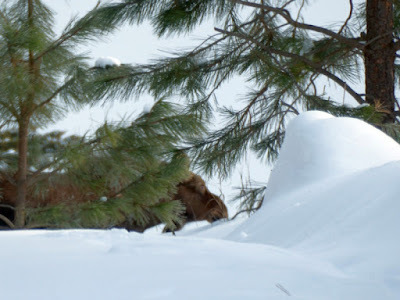 I will probably only see a moose on a NatGeo show. That "lucky shot" is suitable for framing. for such large animals they are elusive it seems. we have always seen signs of them walking through the yard, but never a sighting until last fall. i was sitting in my sewing room when my husband walked in to talk to me. 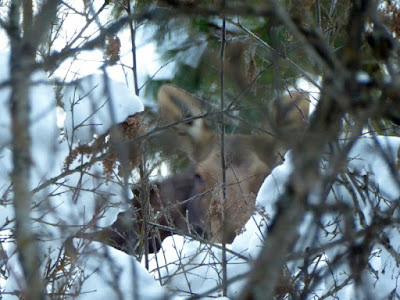 he pointed at the window and there in the front yard not ten feet from where i was sitting was a huge moose! and the window was open, i never heard a thing. it stared at us long enough for me to get a few pics and then it just slowly rambled up the driveway to the road! they do scare me a bit! I'm glad we don't have them in our area; it's bad enough the state keeps releasing elk here. They may be neat to watch, but the deer alone have put a lot of orchardists and nurseries out of business, since the state refuses to control them. I can only imagine what elk will do, once established. In New England we call them Swamp Donkeys. 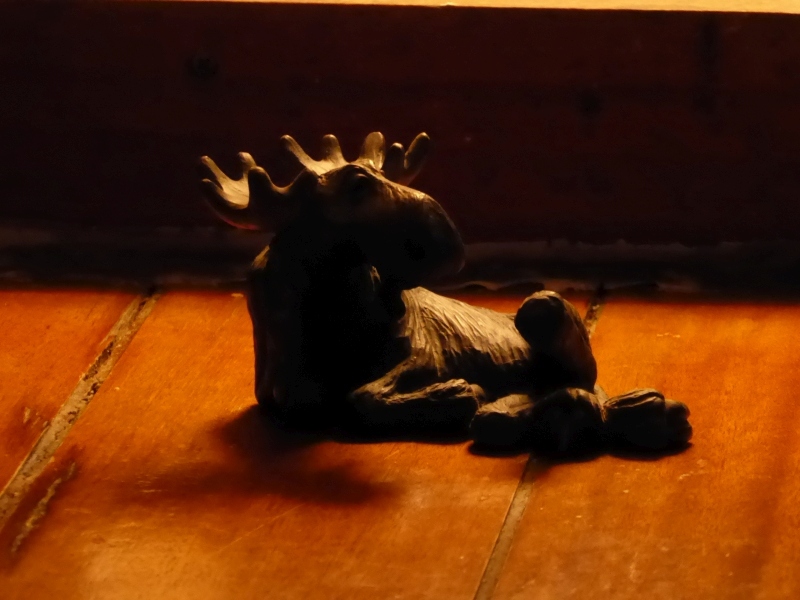 We laughed together at church the next Sunday about the camera and tripod she abandoned for dead in the driveway when the moose got close. As large and awkward as moose appear, they can cover a lot of ground very quickly. She did the right thing high-tailing it to the house when she did. wow that video was truly awesome! haven't ever been quite that close to a moose! 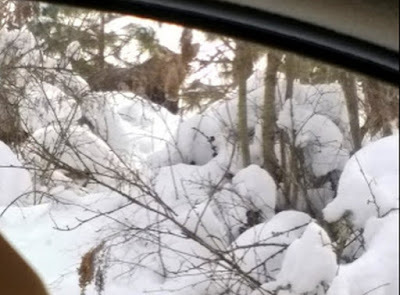 This fall my husband and I saw a baby moose(head and ears) laying in the bushes beside the river,while we were canoing in Island Park. pretty awesome wished i had my phone at that point to take a picture, but of course in the water i didn't. 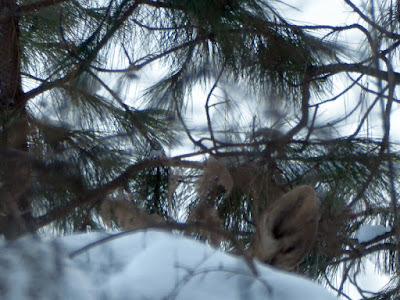 I have seen them from a distance on my mom's property a few times in South East Idaho. Alsojust before I was married, I was visiting a neighbor of my mom and a huge bull moose came running into their yard, was awesome to see him run & jump the fence by the gate. my fiance thought it was super cool too, he being a newyorker! Wow dittos. Now that's 'being at the right place at the right time'! Thanks for sharing. 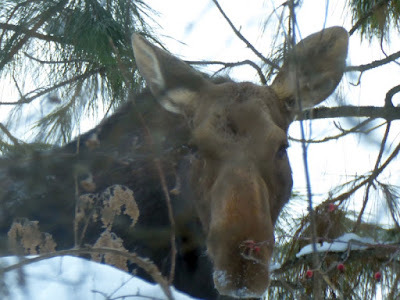 When I moved here in Idaho last year, I was home alone and while in the kitchen in a snowy winter day, this huge moose walked by my kitchen window, it really startled me and at the same time made me realize the wonder of it. Later on in Nov when the top of a quaking aspen broke off, there was that moose munching away, all... day... long. So much for getting wood for my fire. I have since discovered that it was a female an probably pregnant at the time because she now visits with her baby to munch on shrubbery. Now I know why all the tips look like they have been sheared, along with all my tomatoes. 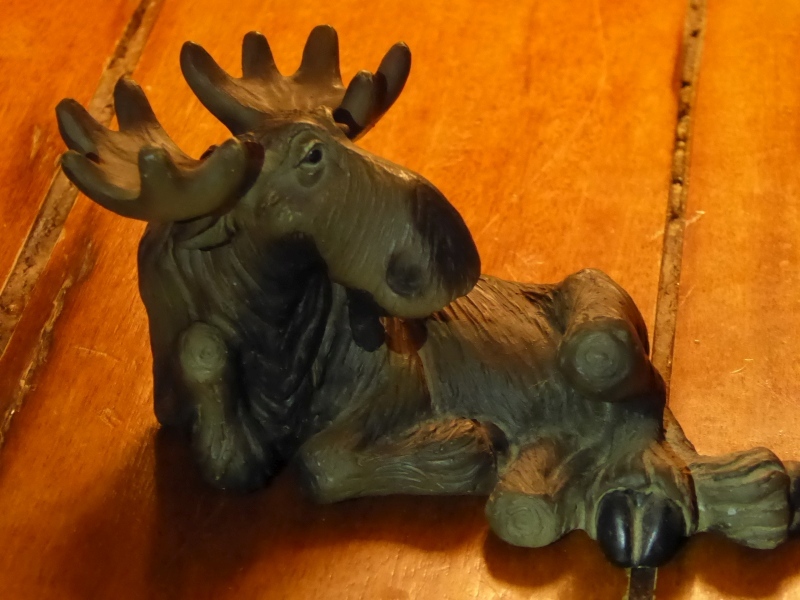 When I told a relative she dubbed her Molly Moose, so we are now on a Molly alert. We really love her but all my garden will be fully fenced for the coming season. Dear Patrice - In 1970 (or thereabouts) my friend and I were traveling home from a Supreme's concert at the University of Maine in Orono Maine. We were 18 years old - she was driving. Suddenly a large dark "thing" came up in the road before us. It actually hit us and of course, scared the living daylights out of us. Suddenly we heard running and saw a huge man(well he looked huge to us) coming up on the car from the back - he looked like Mr. Clean - that was almost as scary as the collision. Anyway, as we soon learned, he was a local doc. He heard the collision and came running. Couldn't believe we were alive and well in the car. It appears the moose's antlers made contact with the windshield, and cracked it into pieces. Thank Go we didn't hit it broadside. The doc said the moose just ambled down the road, apparently unhurt and unbothered by the whole thing. Anyway, whenever I see a video of the supreme's in concert, I remember the moose. The concert by the way, was wonderful!!! Reminds of a summer day hiking in Kincaid Park in Anchorage. As we rounded a bend, there blocking the path was moose calming chomping away. We looked at him... he looked at us... he posed for pictures... and then wandered off. Our daughter was living in Alaska at the time and when we told her of this her reaction was "Are you nuts?! They are dangerous!"